Jack “Smart Gui” Simpson was born along the Barwon River between Boorooma and Brewarrina in about 1880. Little is known about his parents, Jack Simpson Snr and Louisa Khan. Louisa is thought to have moved to Orange where she passed away. 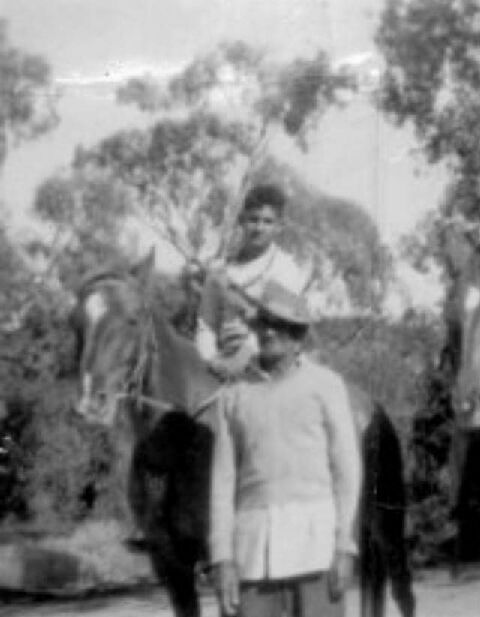 Jack told stories to his family of tracking Jimmy and Joe Governor in 1900 after the Breelong massacre near Gilgandra. The case took Jack as far as Singleton near where Joe Governor was shot and killed. Jack also worked as the tracker at Byrock, reporting to Sergeant James who ran the station. Jack lived with other families near the Byrock waterhole, an important mythological site for Ngemba people. Sergeant James later took Jack to Bourke to work as the tracker. In the late 1960s, Jack’s five-year-old grandson Clifford went missing from the Bourke open-air cinema. Jack soon picked up his tracks, following them to a tap where Clifford had stopped for a drink. The little boy was found soon after. Jack sometimes walked the country between Gundabooka and Brewarrina. He knew many important sites along the way. Jack may have met his first wife Clara Frail at Gundabooka. They were married at Brewarrina in 1911 and raised five children together. Jack later had four children with Linda Fernando. Many of his descendants live at Brewarrina, Bourke and Walgett to this day. Jack passed away at Brewarrina in August 1974 and was buried in the local cemetery. Aside from tracking, Jack was a renowned horseman and also worked as a piece picker in shearing sheds in north-western NSW and over the border into Queensland.